Shikishiban surimono from the series 24 Generals. - Hōjō Tokiyori (1177-1263) "... the second son of Tokiuji, was the regent for the military government in Kamakura He was an assiduous scholar devoted to learning, and he encouraged literary studies and poetic composition among members of the military class. 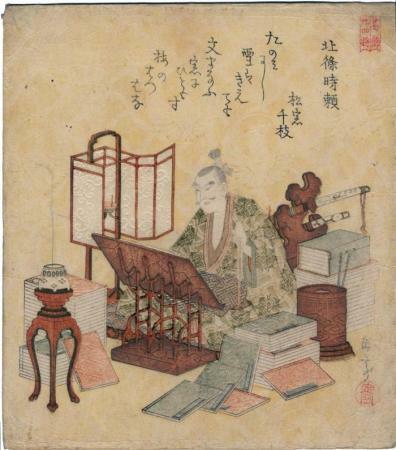 Gakutei shows him reading by lamplight, seated before an elaborate coral book stand. The picture is from a series of twenty-four pictures of Japanese warriors and generals commissioned by the Katsushika Group led by the poet Bunbunsha Kanikomaru. The background of each picture is a bold decorative, over-all pattern of cranes in circular medallions, printed in light yellow. The poem by Shōsō Chie alludes to the story of the poor Chinese student Sun Kang who could not afford a lamp or candles, but pursued his studies throughout the winter by the light of the moon and stars reflected in the snow. 'The snow that I depended on has melted, but I can read my books by the light kindled in the window by the first plum blossoms.' (Tanominishi yuki wa kiete mo fumi manabu mado ni hi tomosu ume no hatsuhana." Quoted from: Keyes, Surimono: Privately Published Japanese Prints in the Spencer Museum of Art, p. 36. Illustrated in color on page 37. Mongols attacked Japan while Tokiyori's son was shogun. Printed with ink, color, mica, metallic pigment and embossing. No one knows who chose the theme for this series. However, it has been noted that a series of 24 generals is uncommon. Also, it should be pointed out that all of the prints in this series have the same background of decorative medallions enclosing stylized cranes.